The kitchen is one of the most important rooms in the house. It’s a place where your family gathers multiple times a day and where you can really express your love for one another through the food you cook. As such, the kitchen deserves to have a welcoming, beautiful design. You can’t afford to have it super cluttered all the time and let it become outdated. But, maintaining a fresh design doesn’t have to be super taxing, either! The key is to find simple ways to upgrade your space. Sometimes, all a kitchen needs to look like new is a different lighting style. If you think this is what your home’s kitchen is missing, check out these five awesome kitchen lighting ideas. Think about the direction your kitchen faces and how many windows are in the room. Maybe it’s time to peel back the curtains in the dining area or get rid of the shades on the window above the sink. These small adjustments make a huge difference. Natural light is one of the best design tools there are. You just need to realize how much of it is available to you and how to best leverage it. When natural light isn’t enough, pendant lights are the way to go. These are small, elegant light fixtures that hang from the ceiling. They can make the walls of your kitchen look taller if you hang them just right, and more importantly, they work very well to brighten up the whole room. Plus, pendant lights come in all sorts of shapes and sizes. You can get sophisticated round fixtures, industrial-looking metal ones, or even use exposed bulbs. Another lighting style that’s great to have in the kitchen is task lighting. If your coffee maker sits under a cabinet or you’re always making breakfast before the sun is up, you need this. Task lighting refers to lights that are placed under your wall cabinets but above your counters. They illuminate small areas of the kitchen at a time, which is perfect when you’re only in there to perform a simple task. Automatic lights are to the inside of cabinets what task lights are to countertops. These are best used in corner cabinets with lazy susans that you need to turn. They’re also amazing for deep drawers and cabinets that go really far back. Such lighting makes it easy to find everything you’re looking for. They’re lifesavers when you’re creeping around the kitchen for a midnight snack, but they also make every day cooking more doable. What if you want to turn your kitchen into a show-stopping part of the house? If that’s the case, buy a chandelier! The right kitchen chandelier looks gorgeous whether you have an open kitchen that leads into the living room or a smaller kitchen that’s a bit more closed off. The trick to this kind of kitchen lighting is to find something that’s proportionate to the kitchen and fits the style of the whole house. 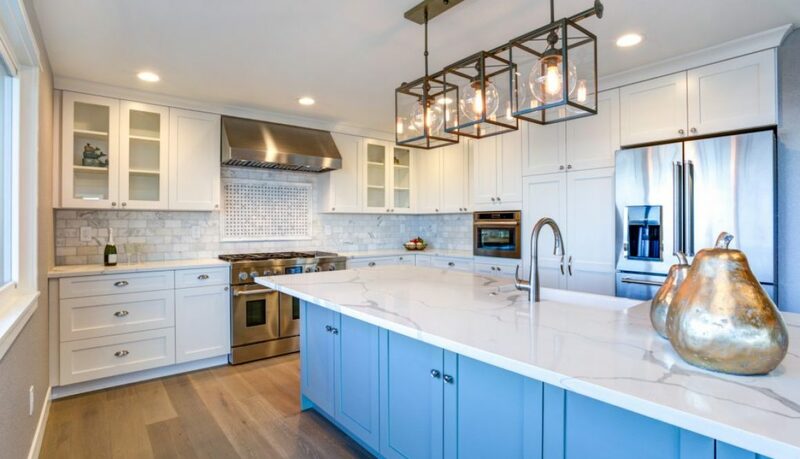 It’s one thing to know which kitchen lighting ideas you want to incorporate in your design process and another to know how to set everything up. The last thing you want is to mess up the lights you’ve worked so hard to pick out and saved up to buy. It’s best to trust the professionals instead. If you’re getting ready to redesign your kitchen – or you’re already in the middle of the project – call us today. We can get your new lights safely and securely installed in no time.